TRIP TO GRIMSBY. 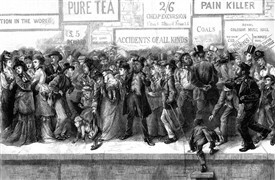 - Early on Monday [July 12 1869] morning last the children and teachers belonging to the Sunday schools in Mansfield in connection with the various bodies of Dissenters, proceeded to Cleethorpes by special train. They numbered about 1000, and returned home about eleven o’clock the same night without any casualty or injury having occurred to any one. About nine o’clock in the evening great consternation was created amongst the parents of the children in consequence of some mischievous person having set a rumour afloat that a telegram had been received by the station master at Mansfield stating that an accident had occurred to the excursion train, and that at least twenty of the children had been killed, and numbers of others injured. Large numbers of the parents rushed to the station in great excitement, but found the report was without foundation. This page was added by Ralph Lloyd-Jones on 12/09/2016.